Thurston County, Wash. June 20, 2018— The sun was shining as Thurston County’s Sports Commission shined a light on sports stars in the community last night at the 2018 Sports Awards. The awards, hosted by the Olympia & Beyond Sports Commission, recognizes local athletes and game changers in our community. Seven award winners were announced at this year’s Sports Awards June 19 at Indian Summer Golf & Country Club. “Congratulations to all of the athletes, coaches and contributors nominated. 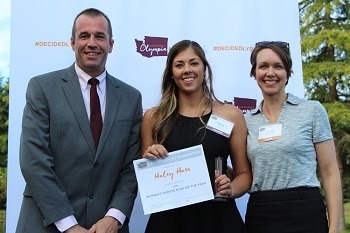 The nominees and award winners capture the breadth of talent in our region and the important role sports plays in our destination,” said Shauna Stewart, CEO at Olympia & Beyond Sports Commission. Nominees must be a female or male athlete enrolled full-time in a Thurston County high school. Nominees must have participated for a minimum of one year in at least one high school sport, exemplify strong leadership, dedication and sportsmanship with good school behavior. Cannizzo was selected by the Sports Advisory Committee for his accomplishment of excelling in three different sports all four years of high school while maintaining a 3.96 GPA. Summers was chosen for her district championships and school records. She has also shown leadership off the field with her school involvement and peer engagement. Nominees must be a female or male athlete enrolled full-time at any time during the 2017-2018 school year in a Thurston County college or a native to Thurston County. Nominees must also have participated for a minimum of one year in at least one collegiate sport, exemplify strong leadership, dedication and sportsmanship with good school behavior. Hassan was selected because he is a leader who inspires others to perform at their very best and has overcome a lot in his life to get where to he is today. The past year he also made the Cascade Collegiate Conference First Team. Harn’s drive for success in volleyball, women’s basketball and academics are why the committee chose Harn. Recently voted Most Inspirational by her teammates, Harn epitomizes leadership. Nominees must be passionate about the growth and success of sports in Thurston County and can include coaches, nonprofit organizations providing access to sports for individuals and/or large monetary donors to sports initiatives. Nominees must have demonstrated commitment to sports for a minimum of one year. Pribble was chosen for his success coaching the men’s basketball team to a school record of 25 wins, first GNAC Championship title game appearance, first NCAA tournament appearance and advancing to round 32 of the NCAA tournament. Pribble has also played a role in growing Saint Martin’s youth and team summer camps. Sports Moment of the Year Nominees can be a team or individual that has achieved national or local recognition for their sports moment during the 2017-2018 academic year. This moment would have taken place during a play in a single game or individual match or event for an individual or team. Nominees can include individuals with either inspiring stories, remarkable sports moments and or outstanding performances throughout the 2017-2018 season. Saint Martin’s University Men’s Basketball Team was awarded for their monumental season including advancing to the GNAC title game and the NCAA tournament for the first time in program history. Nominees must be an individual (over the age of 18) that was born or resided in Thurston County for a minimum of five years and must be passionate about the growth and success of sports in Thurston County. The nominee must have maintained and continue to maintain ties to Thurston County through philanthropic events and/or financial donations to support sports in the community. Ideally, nominees would have played either collegiate or professional sports or had a significant impact in the Thurston County sports community. Otton was chosen for this legendary award as the most successful football coach in Washington State history accumulating 394 wins, 131 losses, 25 league championships, 27 state playoff appearances and six state championships, five of those at Tumwater High School. The awards were emceed by local broadcasting personality Jon Jensen and guests heard a special keynote from Marco Azurdia, executive director of the Northwest Athletic Conference. Representing some of the Northwest’s premier community colleges, Azurdia is a driver in bringing tournaments to the region. His success as a college basketball coach still fuels coaching techniques for teams around the state. The Olympia & Beyond Sports Commission, a division of Experience Olympia & Beyond, helps drive sports events to the region through direct outreach and assisting event organizers in finding venues, hotels and services. The Sports Commission works in partnership with our local cities, schools and facilities to drive sports tourism to the region.